'Remplissage' is French for 'to fill in'. 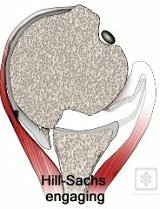 The procedure was described in 2007 by Wolf et al  as an adjunct to the arthroscopic anterior stabilisation procedure of the shoulder in order to address a large engaging Hill-Sach's defect. 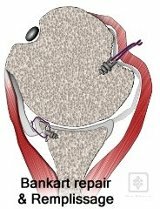 The Remplissage technique has been reported to be effective in reducing the incidence of recurrent anterior shoulder instability, when used along with arthroscopic Bankart repair [1, 2]. This technique is preformed when the Hill-Sachs lesion is very large and 'engaging' the anterior glenoid with little overhead movement (i.e. dislocating very easily due to the large Hill-Sachs lesion, as well as the Bankart lesion). In these situations a Bankart repair alone may not be sufficient. Thus the development of the remplissage technique. We have been performing the Remplissage procedure since 2007 and use the technique after addressing the Bankart lesion. No extra incisions (portals) are made. 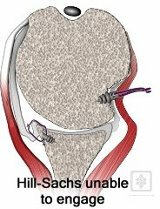 The arthroscope is placed through the anterior portal to view the Hill-Sach's lesion on the posterior aspect of the humeral head. 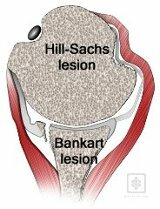 Through the posterior portal, a burr is introduced to decorticate the Hill-Sach's lesion. A triple-loaded large rotator cuff anchor is inserted into the Hill-Sach's defect through the posterior portal. Sutures are passed through the infraspinatus tendon and the posterior capsule, which are then tied down with a 'parachute technique', hence successfully filling the defect on the humeral head. Advantages of the Remplissage technique include the ability to make the Hill-Sach's defect extra-articular, thereby eliminating engagement of the defect with the anterior glenoid rim. It is ideally suited to instability patients who have large, engaging Hill-Sachs lesions and soft-tissue Bankart tears. These patients are known to have a higher failure rate after surgery than those with smaller lesions. The results of this technique in this difficult subset of traumatic anterior shoulder instability patients are significantly better (10% recurrence rate) than with an arthroscopic Bankart repair alone (67% recurrence rate) [1, 2].